With everything that's going on in the world, I feel completely powerless. It feels like a neverending stream of defeat after defeat. We live in a world that currently gives women a long sustained “no. No to most of the things we care most about, no to what we passionately want to protect. No to a woman’s voice, her safe and free sexual self expression, the health and beauty of our planet. No to the voices of minorities and those who are not protected by the legal and justice systems currently in place. No to economic opportunity and rightful compensation for all. The world is a long loud noooooo… and it affects us daily. This has been coming up in classes recently; frequently and feverishly. 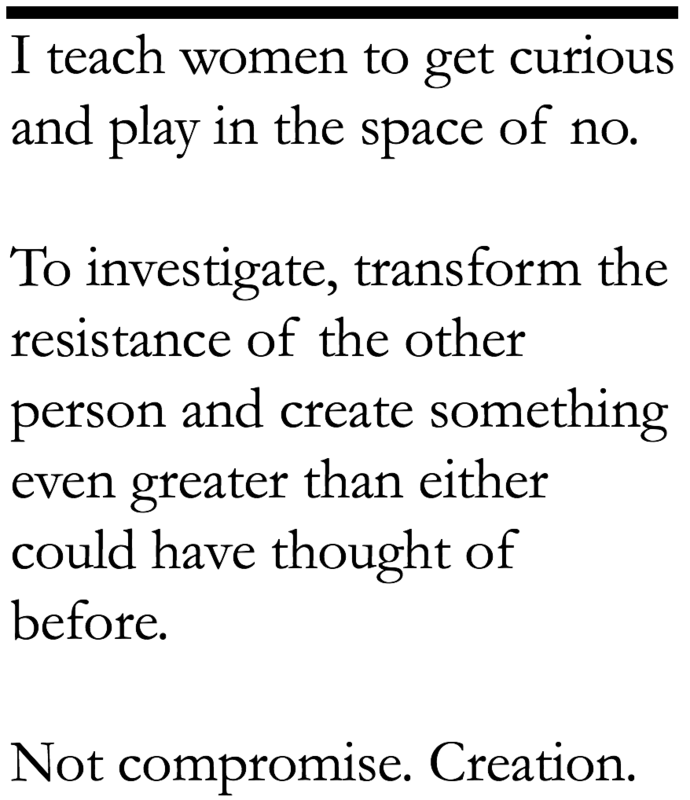 I teach women how to be powerful and playful on an individual level when they are faced with a no. When they ask for something they deeply desire and get a no. When they ask for something they truly need and get a no. When what they ask for is critical to the life of a professional project. When what they ask for is critical to the life of a love or important intimate relationship. When they get a no. When they get a false yes. When they get dismissed altogether. I teach them to get curious and play in that space, to investigate, transform the resistance of the other person and create something even greater than either could have thought of before. Not compromise. Creation. To do that requires no flinching in the face of no. No backing down. It also requires zero attacks, crushing, or aggression. We teach these skills in the school so that women are empowered as individuals so ask, command, invite and express freely. But how does this apply to the daily news of a world that continually says “no,” and jostles the body and mind? In these unique times, how does inoculation to the impact of a “no” from individuals translate to the entire segments of civilization that are resisting the kinds of change that would nourish and empower us all? We live inside of this long, sustained no. So we may as well get playful around it, or suffer daily with every piece of news that shakes our core. At The Academy, we practice on the individual level SO THAT we can take on bigger and wider issues without allowing them to tear at us every step of the way. If the news tires you out and spins you sideways, take a step closer to home. Next time you make a request of someone and meet any type of resistance, see if you can approve of their existence just long enough to get a glimpse of what their “no” is protecting. Once you can see the thing they are trying to protect, validate THAT – not the “no” itself. Your body can begin training to maintain a restful state, even in moments of apparent high stakes conflict. When you can locate and approve of the thing your opponent is fighting for, you’re making use of love that never betrays your own cause, and simultaneously feeds you energy for the long road ahead. Many of my students have reached the place where “no” is their favorite word. They get turned on by it. No can be the sexiest word... with a life of its own right behind it. Because they know that behind that no is the possibility of a new game beginning. One where true creation, not reactive punitive measures, reign supreme. And if nothing else, this game doesn’t tire them out. May we all live in the place where even as we resist, the resistance that comes up to meet us is no longer a trigger to shut ourselves down or take up arms, but an invitation to play powerfully. An invitation to feel fully and feel alive, emboldened and free every step of way, as we walk the path of the great unfolding of what is to come. PS - Our signature course, Power With Men 101, is right around the corner. I hope you'll join us.